Radial Shockwave therapy, or RSWT, is a specialist treatment for chronic and painful musculoskeletal conditions. It is a procedure where shockwaves are passed through the skin to the injured area, using a special device. The shock waves are mechanical and not electric; they are audible, low energy sound waves which work by increasing blood flow to the injured area. This helps to accelerate the body’s healing process. Why should I have RSWT? It is a non-invasive treatment that is carried out on an outpatient basis, meaning that you do not have to stay overnight in hospital and can can go home the same day. RSWT can offer relief from pain and other symptoms. Are there limitations to who can be treated? These will be discussed with you by a member of the team when the treatment is offered. If you have any further questions, or would like any further information, please let us know. Most patients do experience some pain during the procedure. You will be asked how much pain you are experiencing during the treatment and we will attempt to adjust the treatment to help manage this. The pain will stop at the end of the procedure. You will experience a some pain during the treatment, but this should be tolerable. Following the treatment, you may experience bruising, swelling and numbness to the area that has been treated. These side effects should resolve within a week, before your next treatment. The National Institute for Health and Care Excellence (NICE) have deemed this procedure to be safe. How can I prepare for RSWT? You will need to ensure that you are available for the full course of your treatment. You should refrain from taking non steroidal anti-inflammatory or anticoagulant medication (for example ibuprofen or aspirin) for two weeks before your first treatment. You can eat and drink normally before your treatment. Please wear comfortable loose clothing as you will be asked to adjust your position on the couch for the treatment on different parts of your feet / legs. We will put some ultrasound gel on the injured area and then place the hand piece of the device over the surface of the skin and the gel. 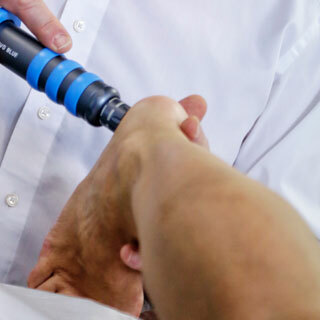 The RSWT is delivered using this hand piece – it delivers compressed air impulses through the ultrasound gel. Each treatment will take approximately 20 minutes. After the treatment you will be able to get up and walk straight away. If you do experience discomfort, you can take over-the-counter painkillers (such as paracetamol), but you should avoid non steroidal anti-inflammatory or anticoagulant medication (for example ibuprofen or aspirin) or ice therapy, as these can interfere with the body’s healing process. Call Exeter Clinic for a biomechanical examination in Exeter.